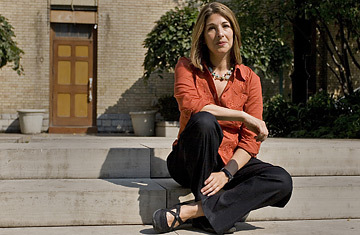 Naomi Klein is a Canadian journalist, author and activist. Naomi Klein: I went to Iraq a year into the occupation and was researching the intersection between the shock and awe invasion and how it was supposed to have laid the psychological groundwork for [Bush's Iraq envoy]Paul Bremer's extreme country makeover that first summer. And what I was looking at, the tail end of Bremer's stay, was how shock therapy had backfired in Iraq  and by shock therapy I'm referring to the economic policies that were really seen by many Iraqis as a continuation of the war, like the huge layoffs in the public sector, the dismantling of the army, the opening up of the country to unrestricted free trade. It was an extraordinarily unfair way for Iraqis to enter the free market. And it was really seen as a kind of a pillage. So I became interested in this idea of what happens to our minds when we go into a state of shock and why was this is such a powerful metaphor for both the military and the economic architects of the war. But I still wasn't sure that this was something that went beyond Iraq. When I first used the phrase "disaster capitalism" it was because I had found out that something very similar was happening in Sri Lanka after the Asian tsunami where just days after the tsunami hit the government started pushing a very unpopular privatization agenda of water privatization and electricity privatization, which had actually been rejected by voters in an election eight months before the tsunami. In your research did you find that you are the first person to come up with such a theory? People spontaneously started using "disaster capitalism" to describe what was happening with what they were seeing around them because it was so clear that this disaster was being harnessed to push through a radical vision of totally unrestricted markets. And Bush didn't make too much of a secret of it when he announced that his idea of reconstructing the Gulf Coast was to turn it into a tax-free, free-enterprise zone. What the book is doing that's new is it is connecting these contemporary capitalisms, which I think most of us can easily see in Iraq and in New Orleans, and saying actually this isn't just some twisted invention of the Bush White House. That actually there is a history. Every time there has been a major leap forward for this fundamentalist version of capitalism that really doesn't see a role for the state, the ground has been prepared by some kind of shock. In the book you frequently take the idea of "disaster capitalism" back to Milton Friedman. So is this his fault? Milton Friedman is held up as really the guru of the modern global market. But my view on Friedman is, I don't think it's his fault in the sense that the role he played was more dictated by history and forces far more powerful than him. I think he was a gifted popularlizer and a gifted communicator, which is one of the reasons why the University of Chicago was so lavishly supported by Wall Street and why his own projects were very much supported by [corporations]. But the other side of it  and I think this is much more important  is the way in which the University of Chicago was used a tool of U.S. foreign policy. That's why I concentrate so much on Friedman and the University of Chicago because in the 1950s and '60s there was a strategy at the U.S. State Department to try to challenge the rise of economic nationalism in the developing world, particularly in Latin America. A move to the left in Latin America that was threatening the interests of U.S. foreign multinationals in countries like Argentina, and a sort of counteroffensive was launched that involved bringing hundreds of Latin American students to study at the University of Chicago under Friedman and his colleagues. When the peaceful battle of ideas didn't defeat the left in Latin America, then you had a wave of military coups, often supported by the CIA, and many of these U.S.-trained Chicago boys, as they're called in Latin America, rose to prominent levels of governments  heads of the central bank or finance ministers  where the economic shock therapists were working hand-in-hand with the very real shock therapists who are in control in these countries through repressive means, including torture. You mention tons of different instances in which "disaster capitalism" is at play, but which example best conveys what you are trying to say to your readers? Well I just got back from New Orleans and I was so struck to see these huge housing developments it's just so clear that this thing that's being called reconstruction is nothing of the sort. The tragedy, in part, was created by 25 years of neglect of the public sphere, by the culture of neglect, that allowed the levees to crumble, that allowed the transportation system to erode to the point where it couldn't handle an evacuation, that allowed FEMA to be this hollow shell run by contractors, who couldn't seem to find the Superdome for days. So here you have a disaster that was in part a disaster created by this very ideology. And then you have billions of dollars liberated in the name of the victims of this tragedy and suddenly there's a possibility for parents and teachers  for some of the poorest people in America who had been so betrayed by their government  to build the system they've always wanted, to build the housing projects that they've always wanted, and to heal from this shock by being a participant in the reconstruction. Instead of that, the trauma was actively exploited and the fact that people had been spread all over the country and separated from their families and their roots and their communities was taken advantage of, in order to turn New Orleans into this Petri dish for ideas that live in think tanks.